Vampire & Friends [W5829] - $18.34 : Yarn Tree, Your wholesale source for cross stitch supplies. Cross stitch pattern by Alessandra Adelaide Needleworks. 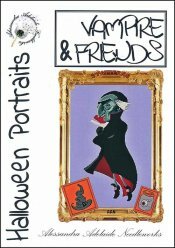 You can't forget about the "Vampire & Friends," on Halloween! "Vampire & Friends," features three designs. The first design features the vampire wearing a black cape with his arms crossed. The second design features a witch's hat, while the third design features a glass jar with an eye ball. Have a spooky Halloween! Stitch counts: 107w x 219h, 62 x 74, 60 x 68.